Some of the best decorating ideas come to us when we step outside our own home, take a stroll down the street, and check out what other people are doing. In this case, we had to travel all the way across the Atlantic to learn what it really means to create the perfect winter escape. Photographer and product stylist Susanna Hawkins is a seasoned nester. Based in Bath, England, Hawkins has been documenting her design journey under the guise of her blog and Instagram account, SHnordic. As the name suggests, her style has largely been influenced by Scandinavian living. “I call my style Scandi-maximalism as, although I like the minimal and clean lines of Scandi designs, I like having more layers and beautiful things,” explains Hawkins. 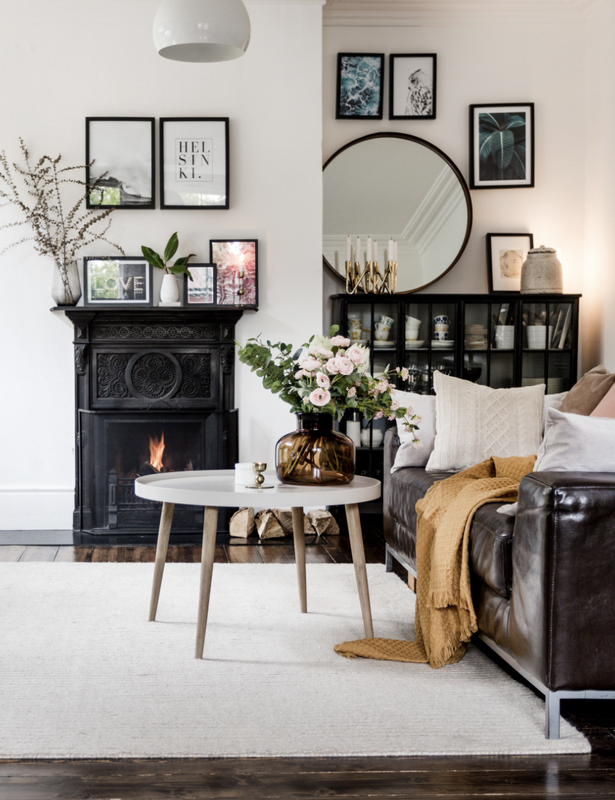 While Hawkins and her family are currently in the process of renovating a split-level bungalow, the creative took us inside her former residence—a dreamy, detached Victorian—to school us on the art of cozy. Here are five short and sweet tips for a happier space this winter. If summer is all about seeing and doing, then winter is all about touching. Why do we spend the season curled up beneath the sheets or with a piping-hot cup of tea in hand? We like the feeling. Physical touch is a huge part of how we navigate cold, dreary days, which is why Hawkins says she prefers texture over happy prints or patterns. Picture this: a heavy, woven jute rug, a chunky, knit blanket, and crisp bouquet of eucalyptus. “I like muted, neutral colors with pops of color,” says Hawkins. Muddy pinks, lilac, and mauve are colors typically equated with the likes of springtime. However, their cooling tones make them great picks for winter too. Blush placemats and fresh peonies bring life and depth back to a chilly space. And, we mean every seat: office chair, dining chair, and entry bench included. Part of settling down and hibernating is having the freedom to do it anywhere—not just the bed or living room sofa. Gather your crew of blankets together and place them casually throughout your home. When every room is just as enjoyable as the next, you won’t feel cooped up for four months straight. The first thing Hawkins does when the temperature begins to drop? “In the autumn, it’s all about knitted throws and velvet cushions, candles, and having the fire on,” she shares. While Hawkins happens to have two functioning fireplaces in her home, we’re big fans of re-creating a similar scene in a nonworking fireplace by lighting a series of freestanding candles. Once the fire (faux or real) begins to roar, go around each room and play with different lighting settings. Dim down or switch off bright overhead lights and instead use smaller fixtures and table lamps to set the mood by placing them in various corners. In Hawkins’ snow-white kitchen, for instance, a transparent pink globe creates a luminous glow. We can’t wait to see what the blogger does with her next place. Follow along on @shnordic.